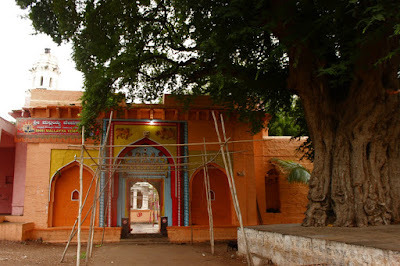 Devara Hipparagi village east of Bijapur on Bijapur-Jevargi road. On the outskirts of the village is stream, on its bank is Mallayya Devasthana. The temple is quite popular in this region. The temple has 1000+ years history. The temple popular by itself is also known for its tall Deepatambha (also called as Mahalagumb) and tamarind tree. The lamp-tower is almost 70 feet tall. Its is said that light at fire at the tower top was visible as far as Bijapur hence this was like a lighthouse for travelers. The tower was probably built during Adil Shahi's time. 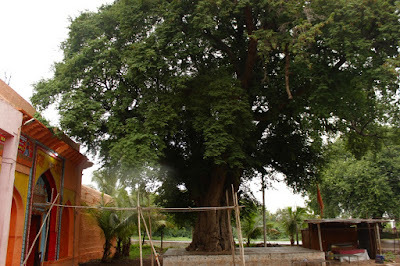 The tamarind tree is said to be planted back then ..going by the look of its trunk, the tree is really old. It is similar to the trees seen at Adil Shahi summer resort at Kummatgi. I'm guessing this isn't the only ancient tree. 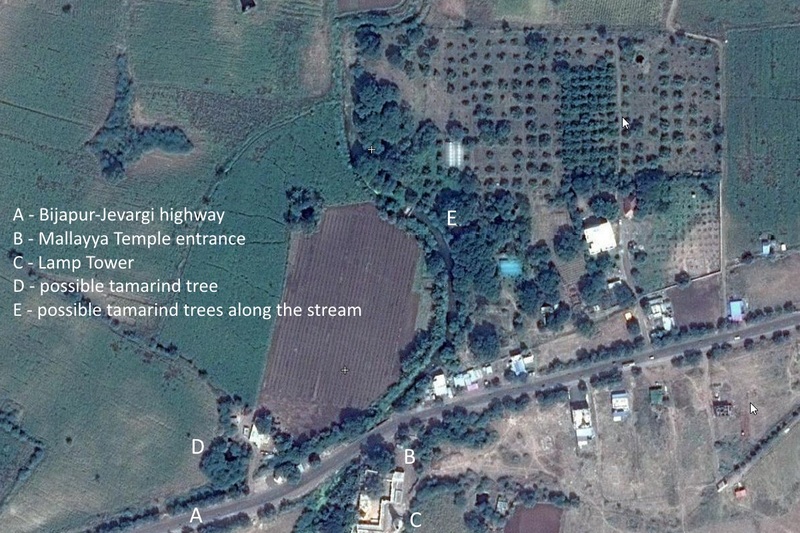 Probably there are few more trees in the vicinity especially along the stream. Next time when I visit Devera Hippargi I'll check out points D and E marked in this Google Maps screen-shot here.